November is nearly over and I have not posted at all! At the end of October and the beginning of November were our annual trip to the apple country in North Georgia (we even took a few steps into Tennessee this time) and the Princess' Coffee Shop Recital. I actually have a lot I could post, but as you know, it is not just the writing, but looking through pictures to post and uploading the video...and, yes, of course, I know I could just get it done instead of writing about what I should be doing! Sometimes I really hate technology. It makes it very easy to have more demands on my time. However, the reason I am behind in getting things posted is because I have been focused on another interest that gives me much pleasure: our rabbitry. My husband and I agreed to focus on breeding pure bred Silver Foxes while still crossing with New Zealand Whites at times. As well as what we have been doing, we are going to offer them for sale with pedigrees. For the past month after G's false pregnancy and then rebreeding, I have been looking at software for creating pedigrees and finally decided on one that allows some customizing and was not too costly. We do not have to get fancy for the pedigrees, but the artist in me never passes up the opportunity to create a logo. We all decided on a name for the rabbitry. I made new and improved cage ID cards, which one rabbit likes to nibble on, of course. (Thankfully, only one.) I also designed several forms to manage breeding and bunny assessments to put neatly in a purple binder, one that I picked up at a Goodwill that was calling to me without me knowing why at the time. Anyway, I am going to be managing the rabbitry unlike we had been doing before by keeping better records. I was very happy to see no brokens (spotted) in this kindle. which would have eliminated the buck as a breeder in my breeding plans immediately. Although not absolute, having no brokens suggests that the NZW buck is not likely carrying the gene because the En (broken) gene is dominate. The Steel is the second we have ever gotten and it looks like its mother in that respect, although Steels generally are disqualifying for showing in nearly all breeds, I find them to be pretty and look like typical wild rabbits. The Ruby Eyed Whites were the most expected, since the mother carries the white gene and was bred with a New Zealand White. The white gene is actually recessive, but when there are two recessive white genes, cc, they will cover all the other genetics, so test breeding is the only way to determine what a Ruby Eye White is carrying. For instance, if the NZW we bred had the Steel gene, it would not be seen otherwise. As big as a mystery REWs are, this time it is the Black that poses the bigger mystery to me. That one could resemble the Silver Fox fur, as it seems to have the no-fly back fur, but it is highly doubtful that the NZW sire would carry the recessive silvering gene. Like the white gene takes two to dominate the coat color, it takes two si genes to show silvering. The Black could be a self (solid) Black as it looks to be; or it could be a super or double Steel that makes the entire hair look black like a self; or it could even be a self Black with Steel that cannot be seen. Since the mother carries Steel and Steel is dominate, it would only take her one Steel gene for it to have Steel. If both parents pass on a Steel gene, then it could be a super Steel and so instead of the hair shaft looking black at the base and gold at the tips, it might appear completely black. Test breeding him and his father with self doe like my Silver Fox would reveal more about the father's genetics, but we are getting tight with cage space, even though that would be interesting. Do you understand why I would want to keep records? On top of that, I decided to I would need to break a personal rule...it was more of a guideline to be honest. I have always said that it is not a good idea to try to maintain more than one blog, because a person cannot really compartmentalize the parts of her life: for instance, at one point I could have had a blog just for book reviews, but I was not trying to be a famous book reviewer, it was just something I enjoyed doing for a time, and what we read contributes to our perspectives in life. Truthfully, I rarely have anything one thing that would be worth a blog by itself because I am interested in so many things and rarely stick to anything for a long period of time. Yet, there are situations that make it quite wise to have a separate blog. This is one of those, so I will be creating a blog/website solely for the rabbitry separate from this blog. I am not even going to state the name of it here because I do not want it linked to this blog at all. The reason I have decided this is two-fold. 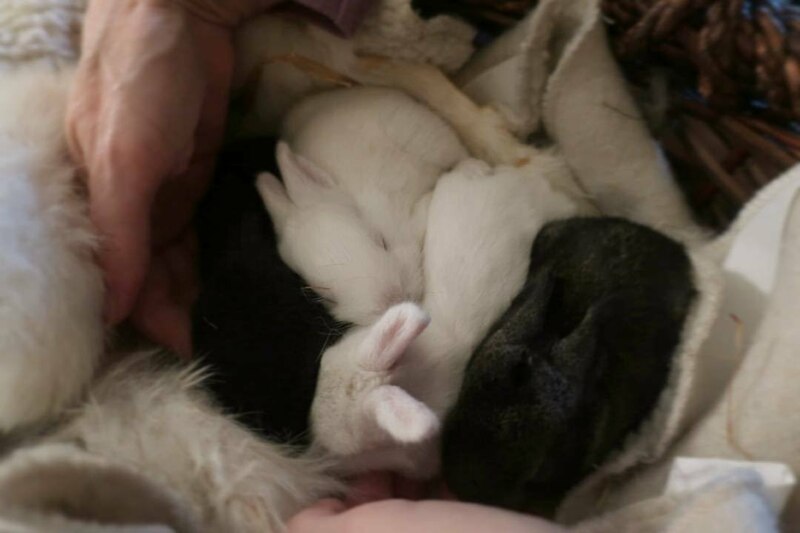 First, I want to be able to send prospective buyers and breeders and others looking for information about our rabbits and not know so much about our personal lives, especially those who could make trouble for us, as some people who believe that animals should have rights over people, have been known to do. Second, I really do not need to subject my sensitive readers to all that we shall be doing with the rabbits, which might include recipes and attempts at tanning hides. So, speaking strictly about blogs, I shall keep the rabbitry apart from my sanctuary. Thank you, my Lord, that we have choices in our lives and that while we cannot yet do homesteading as we would like, and we may never be able to, that we are able to do this much and that we enjoy it. The new blog has been removed from this account and is in an entirely separate one now. Google is messing with me about that so I use two different browsers to keep logged into them separately.